Frisco, Tex. – The Dallas Stars announced today that the club has agreed to terms with six players on free agent contracts. Right wing Michael Ryder, right wing Radek Dvorak, center Vernon Fiddler, defenseman Adam Pardy, defenseman Sheldon Souray and center Jake Dowell all agreed to contract terms and with join the Stars for the 2011-12 season. Free agent right wing Michael Ryder agreed to terms with the Stars on a two-year contract worth $7 million ($3.5 million per season). Ryder, 31, has played in 549 career NHL games, scoring 162 goals and 172 assists for 334 points. He was a member of the 2011 Stanley Cup Champion Boston Bruins last season, skating in 79 games and collecting 41 points (18g, 23a) and 26 penalty minutes. During the playoffs Ryder dressed in 25 games, posting 17 points (8g, 9a) and 8 penalty minutes. He led the Bruins in power play goals last season with eight and ranked tied-for-second in game-winning goals with six. The Bonavista, New Foundland, native skated in all 82 games in 2009-10 with Boston, tallying 33 points (18g, 15a) and 35 penalty minutes. During the playoffs he played in 13 games for the Bruins, posting five points (4g, 1a) and two penalty minutes. In the 2008-09 campaign, Ryder posted 27 goals and 26 assists for 53 points in 74 games. Among all NHL players he ranked 11th in plus/minus during that season at with a +28 rating. During the playoffs that season Ryder accrued 13 points (5g, 8a) in 11 games for Boston. The 6-0, 192-pound right wing has never finished a season with less than 30 points and has scored 25-or-more goals in four of his seven NHL seasons. Of his 162 career NHL goals, 71 have been while on the power play and 29 were game-winning goals. Ryder has skated in 70 career playoff games with Montreal and Boston, posting 43 points (20g, 23a), including four game-winning goals and five power play goals. He was originally drafted by Montreal in the eighth round (216th overall) of the 1998 NHL Entry Draft. Center Vernon Fiddler has agreed to terms on a three-year contract worth $5.4 million ($1.8 million per season) with the Stars. "Vernon is an honest, hard-working player and we are pleased to add him to our club,” Nieuwendyk said. “He plays a solid all-around game and does so much to help a team win. We feel that he fits our vision of a Dallas Stars team that is difficult to play against every night." Fiddler, 31, has played in 452 career NHL games, tallying 59 goals and 86 assists for 145 points. He ranked 24th among all NHL players in face-off percentage last season at 53.9 percent, skating in 71 games with the Phoenix Coyotes. Fiddler scored 22 points (6g, 16a) with 46 penalty minutes, and ranked third on the club in shorthanded time-on-ice at 2:53 minutes per game. He posted his first career hat trick on Nov. 12, 2010 vs. Calgary (3g, 0a). The Edmonton native recorded 30 points (8g, 22a) in 2009-10 with Phoenix. He ranked second on the club in shorthanded time-on-ice at 3:05 minutes per game, helping the Coyotes to an 85.6 penalty kill percentage, which ranked sixth in the NHL. Fiddler again placed in the top 25 in faceoff percentage with a 52.4 winning percentage (588-of-1121) in the 2009-10 campaign. He ranked tied-for-third on the club in plus/minus with a +13 rating. Fiddler skated in six playoff games for the Coyotes, collecting two points (1g, 1a) and 12 penalty minutes. The 6-2, 195-pound center has scored 10-or-more goals in a season three times and has collected 20-or-more points in a season four times in his career. 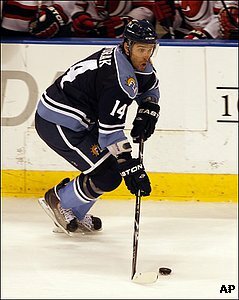 In 2003-04 he helped the Milwaukee Admirals win the Calder Cup (AHL Championship), skating in 22 games during the playoffs, posting eight points (5g, 3a) and 36 penalty minutes. He was originally signed as a free agent by Nashville in 2002. Free agent defenseman Adam Pardy has agreed to terms on a two-year contract worth $4 million ($2 million per season) with Dallas. "Adam is a hard-working player who we feel adds a lot to our defensive corps," Nieuwendyk said. "He will be a good fit among our blue-liners. Adam has a history with Glen Gulutzan and that certainly was a factor with this signing." 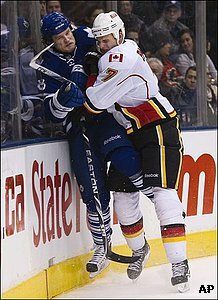 Pardy, 27, spent the last three seasons with the Calgary Flames where he played his first 147 career NHL games, collecting 26 points (4g, 22a) and 141 penalty minutes. In 2010-11, his season was cut short by two separate shoulder injuries as he skated in 30 games for the Flames, posting seven points (1g, 6a) and 24 penalty minutes with a +3 rating. Pardy averaged 14:41 of ice time in his 30 games. The Flames were 17-8-5 when he was in the lineup last season. The Bonavista, New Foundland, native skated in 57 games for Calgary in 2009-10, tallying two goals and seven assists for nine points. He ranked tied-for-fourth on the club in blocked shots with 60 and averaged a career-high 15:51 minutes of time-on-ice that season. During Pardy’s rookie campaign in 2008-09, he skated in a career-high 60 games while accruing 10 points (1g, 9a) and 66 penalty minutes. He ranked sixth on the club in blocked shots with 44 and ninth in hits with 77 in his rookie season. In the 2008-09 playoffs, Pardy played in all six games for the club, collecting two assists. He was drafted by Calgary in the sixth round (173rd overall) of the 2004 NHL Entry Draft. The 6-2, 206-pound defenseman played part of the 2005-06 season under current Stars Head Coach Glen Gulutzan with the Las Vegas Wranglers of the ECHL. Pardy skated in 41 games under Gulutzan, recording 12 points (1g, 11a) and 55 penalty minutes. He also played 10 playoff games in Las Vegas as he collected three points (2g, 1a) and 12 penalty minutes. Defenseman Sheldon Souray has agreed to terms on a one-year contract worth $1.6 million with the Stars. Souray, 34, a veteran of 650 NHL games over 11 NHL seasons, has posted 262 career NHL points (96g, 166a) and 1,020 penalty minutes. He spent last season with the Hershey Bears of the American Hockey League (AHL), scoring four goals and 15 assists for 19 points with 85 penalty minutes. Souray also played in six playoff games with Hershey, collecting two points (1g, 1a) and 16 penalty minutes. 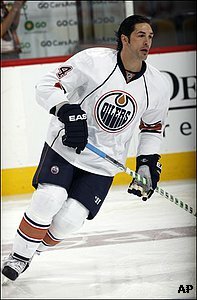 The Elk Point, Alberta, native skated in 37 games for the Edmonton Oilers in 2009-10 after his season was cut short by two injuries (head and hand), recording 13 points (4g, 9a) and 65 penalty minutes. In 2008-09, Souray ranked second among NHL defensemen in power play goals with 12, tied-for-second in overall goals with 23 and tied-for-eighth in overall points with 53 points (30 assists). He also led the Oilers in shots (268) and power play goals and tied-for-first on the club in goals and game-winning goals (5). The 6-4, 233-pound defenseman has scored 18 career game-winning goals, 47 power play goals and has four shorthanded tallies. He has netted 12-or-more goals in four NHL seasons and 35-or-more points in four of his 11 NHL seasons. Souray has played in 34 career playoff games, recording 10 points (3g, 7a) and 68 penalty minutes. He was drafted by New Jersey in the third round (71st overall) at the 1994 NHL Entry Draft. Free agent right wing Radek Dvorak agreed to terms on a one-year contract worth $1.5 million. "Radek Dvorak is a skilled veteran who has played over 1,000 NHL games and we are excited to add him to the Dallas Stars," Stars General Manager Joe Nieuwendyk said. "We feel that his experience and ability adds quality and depth to our forward group." Dvorak, 34, is a veteran of 1,118 NHL games over 15 seasons, scoring 215 goals and 341 assists for 556 points. He began last season with the Florida Panthers and was dealt at the trade deadline to the Atlanta Thrashers, finishing the season with 22 points (7g, 15a) in 63 games. Three of Dvorak’s seven goals last season were game-winners; he also had one shorthanded goal. He was an alternate captain for Florida last season. The Tabor, Czech Republic, native has scored 15-or-more goals in six seasons and has recorded 30-or-more points in 11 of his 15 NHL campaigns. Dvorak has played in 39 career NHL playoff games, recording seven points (2g, 5a) and four penalty minutes. In 2009-10, he tallied a team-high three shorthanded goals for Florida and ranked sixth on the club in shots with 140. Dvorak also ranked sixth on the club and second among forwards in shorthanded time-on-ice in 2009-10 with 2:12 minutes per game. The 6-2, 206-pound right wing’s best season came in 2000-01 when he posted 31 goals and 36 assists for 67 points with the New York Rangers. Dvorak represented the Czech Republic at the 2002 NHL Winter Olympics, skating in four games. He was drafted 10th overall by the Florida Panthers at the 1995 NHL Entry Draft. Center Jake Dowell has agreed to terms on a one-year contract worth $800,000 with the Stars. Dowell, 26, played his first full season in the NHL last year with the Chicago Blackhawks, scoring six goals and 15 assists for 21 points in 79 games with a +5 rating. He registered career-highs in almost every statistical category. A native of Eau Claire, Wisc., Dowell played at the University of Wisconsin from 2003-2007 at the same time that Stars winger Adam Burish did. Twenty of Dowell’s 21 points last season came vs. Western Conference opponents. He led Blackhawks forwards with 43 blocked shots.